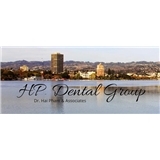 HP Dental Group (Oakland) - Book Appointment Online! PLEASE NOTE: We require a 24-hour notice on all cancellations, and failure to do so may result in a $75 fee At HP Dental Group, we provide you and your family with complete general and cosmetic dentistry solutions that are state-of-the-art, affordable, convenient and comfortable. From the moment you step into our office you'll experience the difference that gentle and personalized dental care makes, and you'll understand why our patients have been coming to us for all of their general dentistry needs for the past 21 years. Always a great visit. Efficient, friendly and feels like I get what I need done.